Minor mold growth in your Pemberton, NJ home or business can quickly escalate and develop into a major problem. The moment a adequate water source is introduced, it only takes 24-48 hours for mold to start spreading throughout your property. If mold is given the opportunity to colonize your home or business, it will eat away at your property and compromise the structural integrity and property value. In addition, exposure to mold could lead to health issues ranging from symptoms as mild as common allergy symptoms to severe respiratory issues. Most Pemberton, NJ homeowners know very little about mold, unless they have encountered a mold problem before. As a result, uncovering prolific mold activity can easily overwhelm home and business owners. Mold should always be approached with a sense of urgency. Mold is a toxic bio-contaminant that should, in a majority of cases, be handled by a professional mold removal company in Burlington County, NJ. While mold cases can range from mild to severe, only a certified mold inspection in Pemberton, NJ can determine, for sure, the full extent of the mold problem, should a mold problem exist. If you are encountering signs of mold growth, and if you are concerned that it might be a serious issue, call a professional to have your property inspected. MasterTech inspectors are meticulously trained to provide you with the most thorough and non-invasive mold inspection possible. The MasterTech inspection process is to designed to assess the full capacity of the mold growth, recognize the moisture source, and game plan the most appropriate course of action for the safest, most effective, and most efficient resolution. 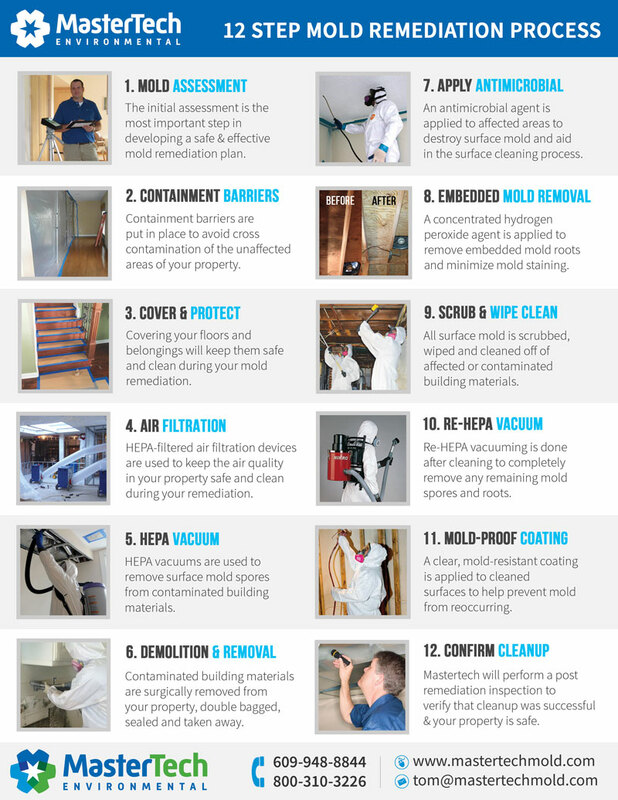 In order to provide you and your family with the utmost safety, MasterTech has developed a mold remediation process that integrates the safest, most effective, and most efficient industry techniques. We have seen the nightmares families go through when they fall victim to a poor or improper mold remediation. MasterTech is dedicated to making sure each of our clients receive the safest and mold effective mold removal in Pemberton, NJ. The MasterTech standard for every New Jersey mold remediation is getting the job done right the first time. Because, when it comes to mold, a bad remediation can mean health implications for you and your family and property damage to your Pemberton, NJ home. For quality control purposes, we always conduct a post-remediation inspection with testing to confirm the job was done right. We also back every mold remediation with a 5-year mold-free warranty. It is our promise that the mold has been properly removed, and it will not grow back. Mold is a bio-contaminant that requires a unique decontamination protocol designed specifically to remove and prevent its growth. To ensure its safe removal, MasterTech uses oxidative technology for mold remediation in Pemberton, NJ. Oxidative technology for mold remediation has revolutionized the mold industry. It offers restoration companies a safer alternative to the hazardous methods developed in the 1980s. The oxidative remediation process has been proven to be more effective at removing bio-contaminants than any other remediation method available in the industry today. Not only is the process more effective, it is also environmentally safe. The process does not require the use of powerful pesticides and there are no dangerous residual chemicals or heavy metals remaining after remediation. Through the use of oxidative technology, MasterTech Environmental can confidently promise you the safest, most effective, and most efficient mold remediation. Mastertech Environmental is trained and certified to perform mold inspections and mold removal in all Burlington County, NJ. For mold inspection and mold removal in Chesterfield, NJ or mold inspection and mold removal in Fieldsboro, NJ, call 1-800-310-3226 to speak to a member of the MasterTech Team.